Billionaire businessman Mark Cuban has a simple request for members of the media: Call out Donald Trump and his surrogates when they tell falsehoods on the air. "Everybody contradicts themselves every other day," Cuban told Business Insider in a recent phone interview. "Okay, now we've gotten so used to it. It isn't even an issue." "So, you know, he knows there is no such thing in news longer than a nine-minute segment, you know? So it's not even his interviews, it's all of his surrogates interviews," the owner of the NBA's Dallas Mavericks and star of ABC's "Shark Tank" continued. "You know, no one says 'you're full of s---.'" He said the perfect example of this was an interview last week between CNN host Wolf Blitzer and Trump's running mate Mike Pence. "Mike Pence is on there talking about charity and how Donald Trump is so charitable and how he gives millions to charity," Cuban said. "And all you have to do is ask any of the charities he's donated to. That should've been the easiest softball in the world based on what the [Washington] Post has written. Nothing! Right?" Cuban said Trump is taking a page out of the professional sports public-relations playbook when it comes to both himself and his surrogates using deflection as a media strategy. "We do it in sports all the time," he said. "It's the sports playbook. 'Oh I love my team, I love this player,' and then we ignore the fact that we're trying to trade him behind the scenes, right? 'This guy is the best guy ever, dah dah dah dah dah, you know of course we're going to keep him in free agency, we want him here, we want him to be on our team forever.' It's the same s--- that happens in sports." 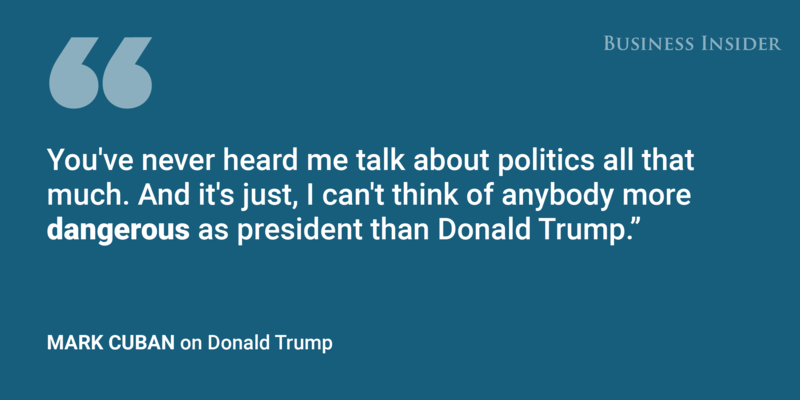 He told Business Insider that the danger of a potential Trump administration compelled him to become politically active in public over the past couple months. A quick search of Cuban's name on the Federal Election Commission's website showed that he had previously only made a single political donation of $1,000 to Rep. Zoe Lofgren of California in 2002. "I mean you guys have been covering me for a long time," he said. "I mean, I've historically been apolitical. You've never heard me talk about politics all that much. and it's just, I can't think of anybody more dangerous as president than Donald Trump." Cuban endorsed Democratic nominee Hillary Clinton at a rally in Pittsburgh, his hometown, in July. Earlier in the cycle, Cuban was more enthralled with the idea of a Trump presidency and had expressed interest in serving as either Trump or Clinton's vice president before eventually souring on the Republican nominee's candidacy.